I used a picture from her first birthday and decided to play up the Canadian and birthday theme with this collection! I started by doing a lot of layering with the patterned paper and washi tape. I then created the Canadian Flag by die cutting it with the lily white chevron sugar coated paper and the ladybug sugar coated cardstock. I finished off the layout by adding lots of stickers and twine from the this & that sticker sheet and the icon sticker sheet. I hope you enjoyed seeing the versatility of this fun collection! Hi Everyone, it's Kathy today with a couple of projects using the new Patriotic Parade. 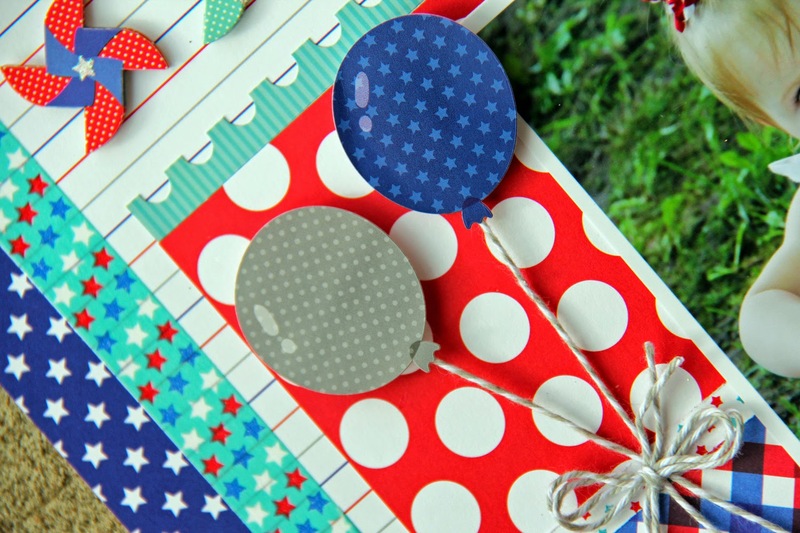 This is such a fun collection, perfect for all sorts of patriotic projects! First, I created a layout featuring my daughter at the Chatham, MA Fourth of July Parade back in 2004. This is such a fun parade...full of fire engines, bag pipes and ever some pirates! Everyone dresses up in their best red white and blue! 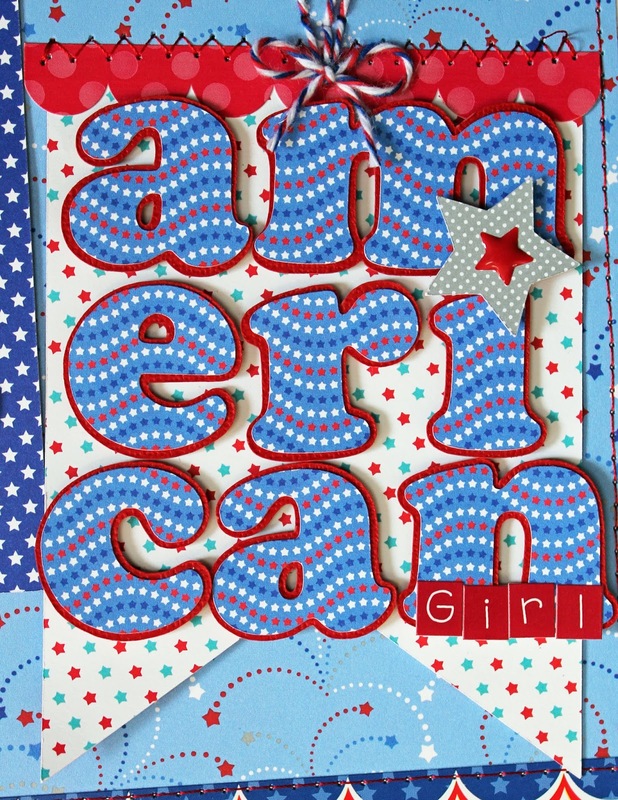 The American in my title was cut using my electronic die cutter. I added some Ladybug Teensy Type letters to complete it. The balloons are from the Icon Stickers Sheet. I embellished them by stitching some strings using the Red, White & Blue Doodle Twine. 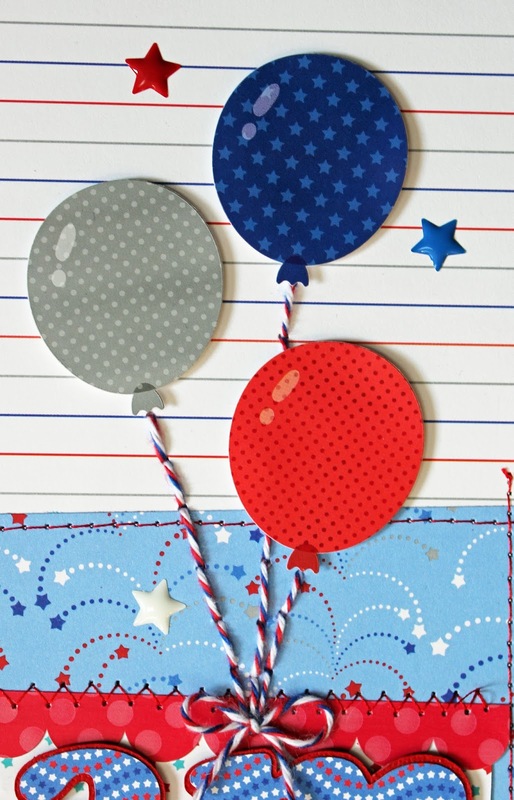 The ADORABLE stars are from the new Red, White and Blue Star Sprinkles! 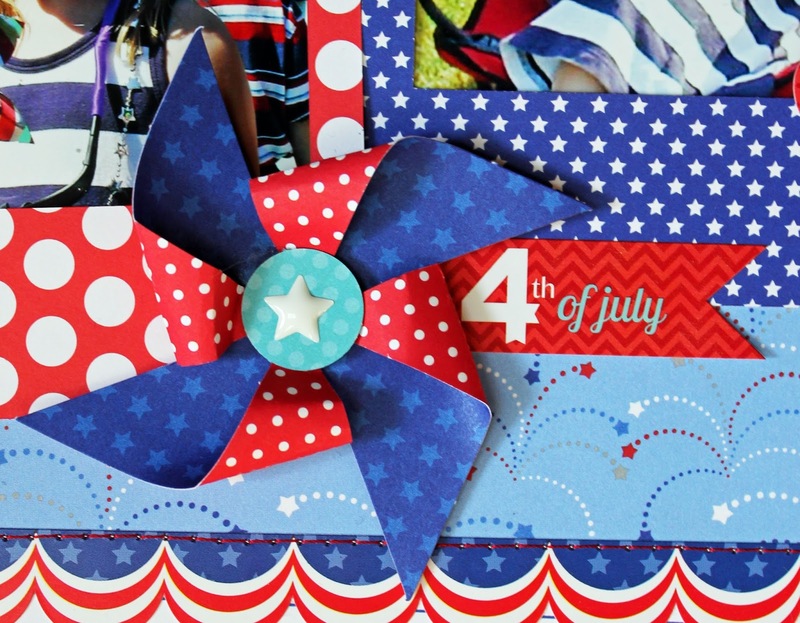 I LOVE the little pinwheels from the Stars and Stripes Pinwheel Craft Kit! They coordinate perfectly with the new Patriotic Parade collection! To complete the layout I created a small cluster using some Air Mail Washi tape, some Icon Stickers and a silver star from the new Star Sprinkles! My second project is a fun little home décor piece. I made a frame and easel completely from paper using a 3-D cut file. I used it to frame a cute little flag made from some Doodlebug Washi, Star Sprinkles and Sequins. I started with some Bubble Blue Swiss Dot Washi and added some Bandanna, Picnic Basket, Lady Bug Swiss Dot Washi and Ladybug Sequins for the red flag stripes. The white stripes were created using some Lily White Sequins, Lily White Swiss Dot Washi and some Lily White Chevron Washi. That's it for me today. 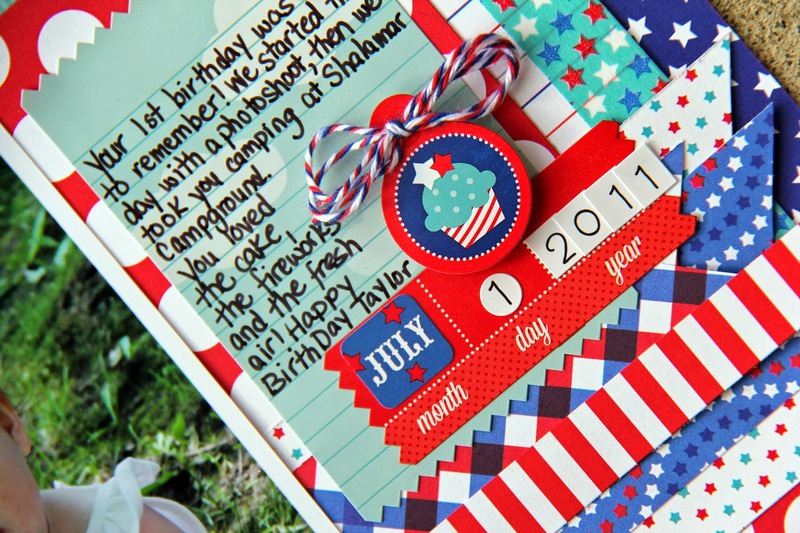 Make sure to keep coming back to the Doodlebug Blog to find more Patriotic Parade Inspiration! Thanks for stopping by! FUN & FABULOUS layouts and decorated frame!!! LOVE the AMAZING detail that Jodi & Kathy have included in their projects!!! 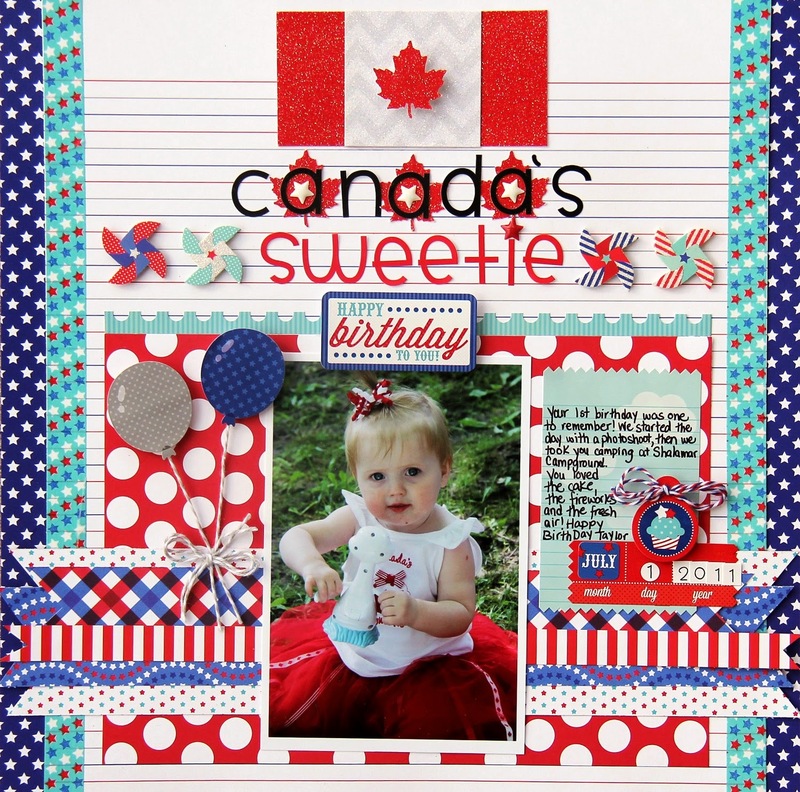 wow these are fabulous, love how Jodi created a Canadian layout with Americana products!!!!! I love this Americana collection. So beautiful and great layouts. thanks for the inspiration. Great that it can show the patriotic spirit for both countries. We are bound so closely. it's good to have one more thing to share. 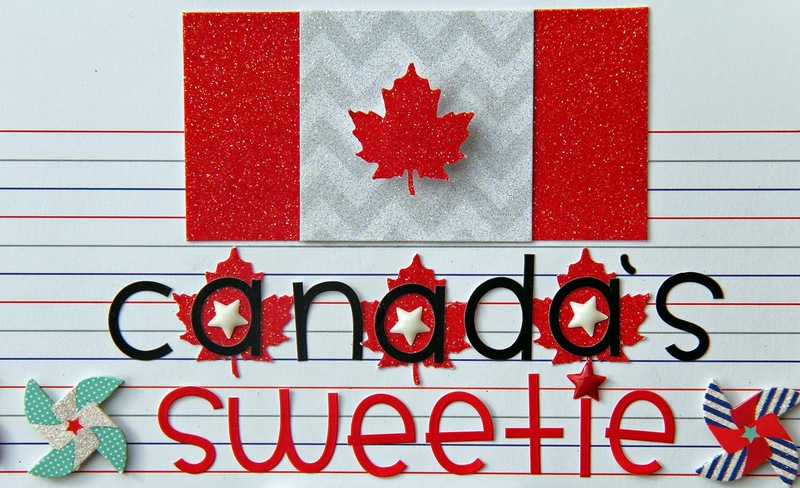 Jodi, I love seeing this collection used for a Canada Day layout! And what an adorable Canada Day baby you have!!! Wow!! Absolutely ADORABLE!!! This collection is just precious. The projects are great and I especially like how the collection can also include the Canadians. Canadians themes are few and far between. Thx for sharing. Super sweet layouts! Adorable pictures! I love the twine and the embellishments. I pinned them all of course! I pinned 4 images to my "Layouts I Love" Board. I too am Canadian and simply love this collection!!! I'm sure it's no mistake that the two largest countries in North America share two flag colours! The combination of red, white, and blue is so energetic and fun - not to mention patriotic. How I would love to have this collection <3! These are all so cute and fun!! Love the layouts!!! I was wondering what font you used for "american" sign. Marie the entire American word was a ready made cut file in the Silhouette store, I didn't put it together so I'm not sure. Sorry! I pinned the close-up pic from Jodi's Canada's sweeties showing the balloons & pinwheels - LOVE the pretty details & dimension!!! I pinned the pic of Kathy's awesome frame & easel - so amazing to know that it was made from paper - WOW!!! 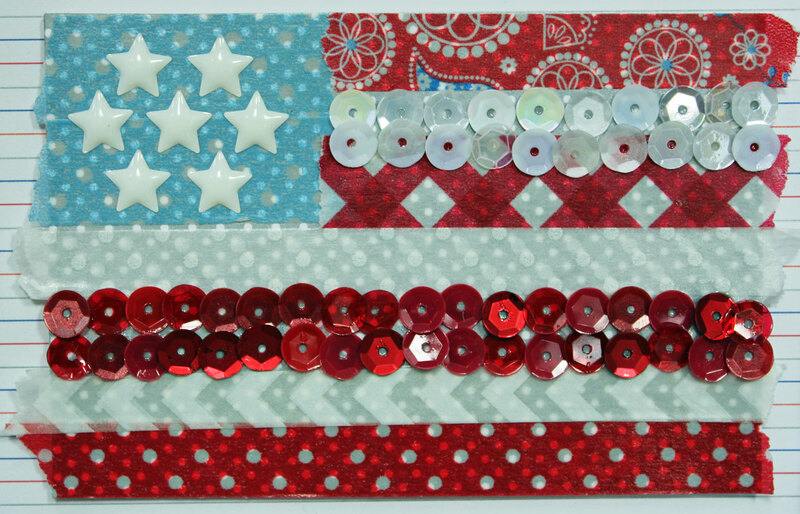 I pinned the close-up pic of the flag inside Kathy's frame - LOVE the washi, sequins and star sprinkles!! !